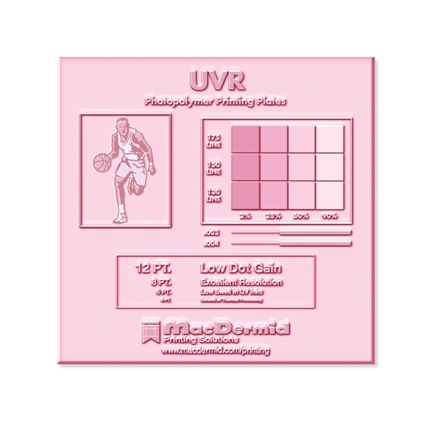 UVR MacDermid’s new UV ink resistant plate, UVR, is designed to swell less than other commercial plates in aggressive UV inks. By their very nature, UV inks can affect flexographics plate material more than solvent- or water-borne inks. UVR plates tend to swell less under these conditions, providing a longer plate lifetime and more consistent print. 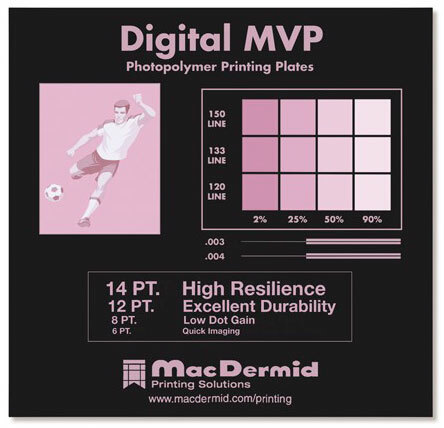 Digital MCH MacDermid expands its capped plate offering with Digital MCH, a new 60 durometer, hard capped plate for those printers seeking the best of high-end, full-color process printing. 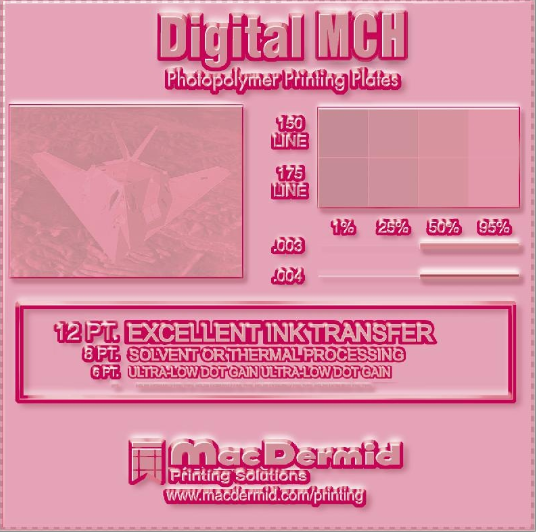 Digital MCH offers a unique micro-rough surface for excellent ink transfer, creating fine imaging detail. The innovative cap layer ensures that the plate provides the best tonal range possible. And because it is wear resistant, you are guaranteed long durability on press. Digital MVP Digital MVP is the digital version of (analog) MVP. It delivers all of the benefits of MVP, plus the fine resolution and imaging capability expected from a digital photopolymer plate. Digital MVP gives you a choice when it comes to processing – it can be processed in solvent systems or thermally in MacDermid’s LAVA processor. Digital MVP plates work well with a variety of substrates and inks. Digital Rave Digital Rave plates are the harder, digitally imaged photopolymer plates with a high durometer that reduces dot gain in screens and minimizes banding due to press bounce. The latest generation digital plates using advanced direct-to-plate technology, and developed using MacDermid’s solvent processing system, our Digital Rave plates’ laser ablative mask improves dot shape and extends image latitude, while also eliminating sources for dust and light diffusion, resulting in increased plate quality and consistency. 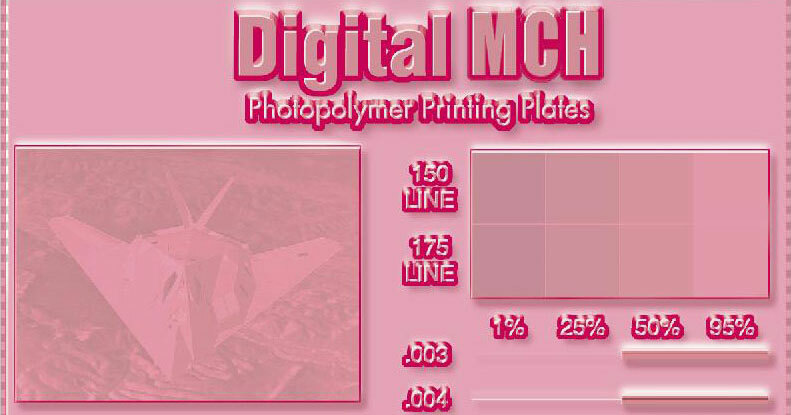 Digital MAX MacDermid Digital MAX is the newest digital sheet photopolymer from MacDermid designed to give you the MAXimum choice, including the capability to be processed either in solvent or thermally using MacDermid’s LAVA processor. 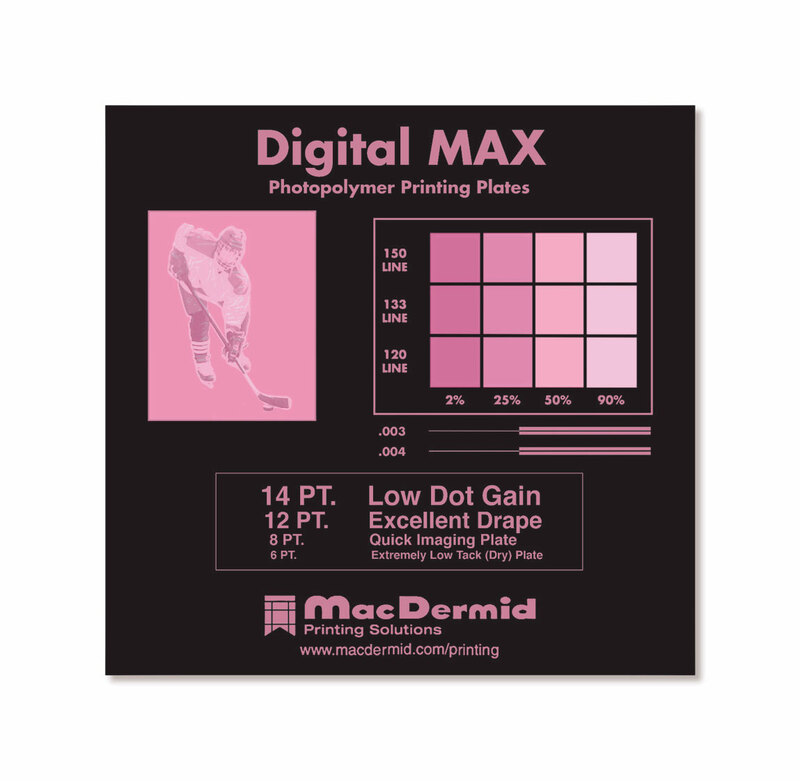 Digital MAX is the digital version of (analog) MAX, offering all the benefits of MAX, plus the fine resolution and detail expected from a digital plate. This hard plate durometer, 60 Shore A, provides excellent drape and has low dot gain.